The theme of this month's photo contest is near and dear to my heart. Unusual, funky or corny locations. Only rule is at least part of an Airstream must be included. For example this one from the VLA (Very Large Array) in New Mexico, my stomping ground, that was also featured with my chidhood heart throb Jodie Foster in "Contact". Thank you Johnco (not to be cornfused with John Hinkley) for the honor of being this month's judge, and good luck to all my brothers and sisters in aluminum. Brownie points for original photos of the world's largest. Je FARM - tu mange !!! Yup I remember the song, but I don't remember any candy corn in it. Ooooh, I *love* this theme. I'm going for the unusual here, rather than the corny. Or, maybe just a touch of corny. Known informally as the "vomit comet", this is the aircraft that was used not only for astronaut training, but also in the movie Apollo 13 for the scenes that required genuine weightlessness (story here). It flew 58,000 parabolas before being retired. 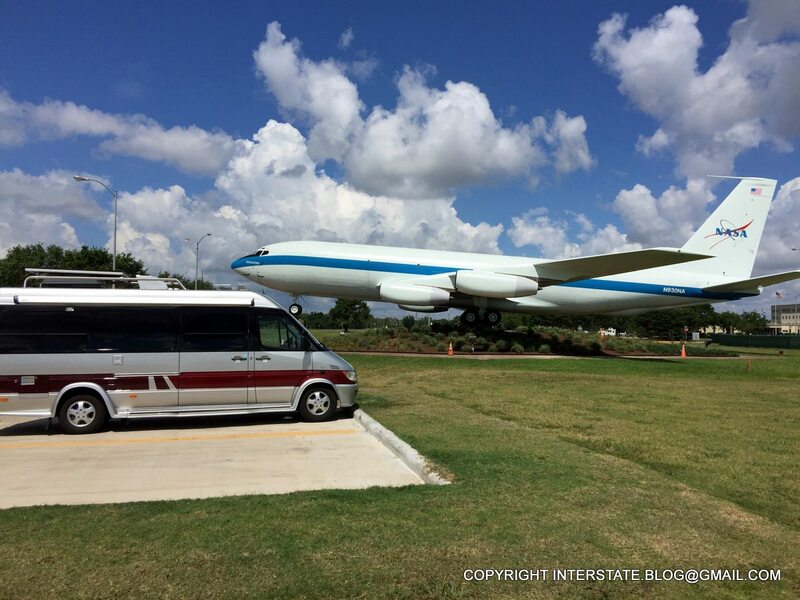 Many people know about the tourist facility called Space Center Houston, but fewer people realize that this gem is on display a few miles up the road at Ellington Airport (which was formerly an Air Force base). Like fellow Houstonian Howard Hughes when he was filming his movie "Hell's Angels", I had to wait months for just the right puffy clouds to appear so that I could get this dramatic pic. And then I had to go early so that there wouldn't be other visitors blocking this view. Happy Easter and April Fools Day. And the Winner is D44's shot of the Corn Palace. D, It now becomes your responsibility to choose the theme of the April Photo Contest and pick the winner. The rules are pretty much up to you but submissions need to be original photographs. Thank you for the honor of honor of being selected to administer the April 2018 Photography Contest. April, 2018's contest is centered around "Bucket List" photos - a location, trip, event or happening that you were able to cross off your "bucket list" with your Airstream. The photo must include your current, or past, Airstream and a short summary of why this is your "bucket list" photo. Here is the link to the April 2018 Photography Contes - "Bucket List"